In a large bowl, combine ground turkey, bread crumbs, mushrooms, and egg. Form mixture into 5 patties and refrigerate for at least 30 minutes. Grill burgers, covered with grill lid, for 5 minutes on each side, or until an instant read thermometer inserted in center of patty reads 165 degree. Spread butter evenly on cut side of ciabatta buns. Grill buns, cut side down, for 2 minutes, or until golden brown. In a medium bowl, combine artichokes and Alfredo sauce. 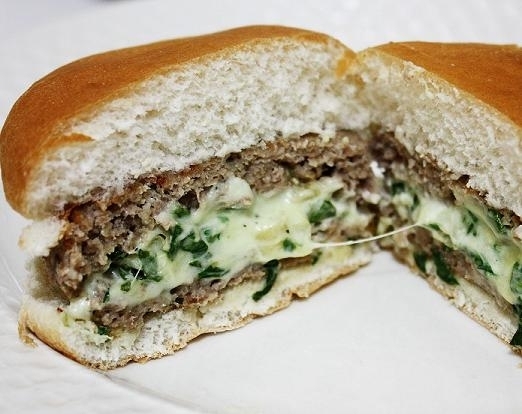 Place turkey burgers on bottom halves of ciabatta buns. Top with desired amount of atrichoke misture and desired amount of basil. Cover with ciabatta bun tops. Serve immediately. End.